It's astounding to me that in His time on earth Jesus was tempted in every way that we are. And by astounding, I mean that I have difficulty believing by faith what Hebrews 4:15 so clearly states: "For we do not have a High Priest who cannot sympathize with our weaknesses, but was in all points tempted as we are, yet without sin." This is an incredible statement, one that starts my mental rolodex of sins churning. Was He tempted to lust? Tempted to hate and hurt? Tempted toward envy and jealousy? Tempted to seek riches and fame? Tempted to oppress? Tempted to gossip and hold grudges? Yes, all of these. Although these are powerful temptations all, I somehow find it easy to believe He resisted them. Because they aren't mine; I don't know their full power. However, when the mental rolodex turns personal, highlighting my besetting temptations and sins, I marvel with gaping mouth that He fought the good fight on this earth and came out perfectly victorious. He was tempted, as I am, to worry, hopelessness, and despair? He was tempted toward bitterness and selective love in His interactions with people? The one that really gets me is that, perhaps even to a greater degree than me, He was tempted to turn away from His Father, knowing the cross that lay ahead, and say, "Not Your will but mine be done." How can it be that His every action, every word, every motivation, and every thought aligned perfectly with the righteous will of God? How grateful I am He resisted the temptation of asserting self-will! This is where tears spring to my eyes, because this is where Jesus' glory shines so bright. He had every opportunity to choose His own way, every opportunity to give up on the people who misunderstood Him, rejected Him, criticized Him, and thought they knew better than Him. In other words, He had every opportunity to give up on me. He was in all points tempted as we are, yet without sin, and this sinlessness was for you and me! How can it be that this perfect righteousness is attributed to us? "For He made Him who knew no sin to be sin for us, that we might become the righteousness of God in Him" (2 Corinthians 5:21). Although it's difficult to imagine Jesus the Christ living in a limited, fleshly body and facing the world's full scope of temptations, it's a vital doctrine of our faith, not only for our minds but for our hearts. Because what follows in progression? Because He has faced and resisted the full scope of temptation the world has to offer, "let us therefore come boldly to the throne of grace, that we may obtain mercy and find grace to help in time of need" (Hebrews 4:16). Knowing Jesus was tempted as we are gives us confidence to go to Him and ask for help. If we don't believe He faced what we face, we run and hide from the only One who can truly understand what it's like to walk in our shoes. Instead of resisting temptation, we resist Him, believing He responds to us with scorn and shame rather than compassion. Our Jesus is your compassionate High Priest. It may be difficult to believe, but it matters that you do. 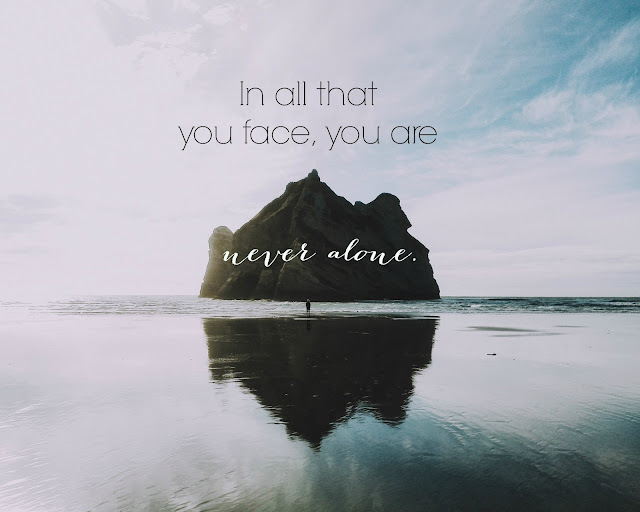 Because in whatever you are facing--and some of you are facing extremely difficult trials each with their accompanying temptations--Jesus stands ready to help you. Will you go to Him?